If you were once hailed as the smartest kid in America, as a child prodigy whose intelligence was broadcasted across the country over radio, why would you try to hide from such an illustrious past? 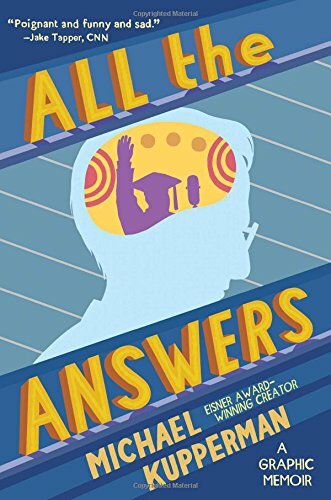 This is the question Michael Kupperman tries to solve in All The Answers, a graphic memoir exploring his father’s, Joel Kupperman’s, career as a child star on the radio show, Quiz Kids, and his attempts to escape its influence on his life and mentality. As dementia begins to rob an already private and absentminded man of his memories, Michael becomes set on reconstructing his father’s childhood from recordings, news articles, and his father’s own accounts, in a journey to understand what had crafted his father into the man he is, and how that has formed Michael himself. All The Answers is told a sentence at a time, with black and white comic panels filling out the rest of the pages with expressions and speech bubbles to give emotion and nuance. Much of the writing is investigative and comprehensive in nature, giving context to the pop culture of the 1940s, when America needed entertainment in the midst of war, the concept of a child prodigy was fresh and enrapturing, and when Louis Cowan created Quiz Kids to manufacture an “appealing Jewish kid” to combat rising anti-Semitism. The concept of manufacturing a person is an ever present theme. Why his father remained on the show and under the thumb of his stage mother for as long as he did when it caused him such isolation and discomfort is one of the most burning questions in the piece. The answer turns out far more subdued yet somber than one might expect. The portions of the story that jump back to Michael’s interviews with his father paint a picture of what long term suppression does to a person. It is in the examinations of his father’s behavior and psyche that the short prose hits strongest, getting right to the point of how trauma can remove a person from the moment, lock off their own past, and downplay their pain, even as they construct their life around avoiding reminders of the subject. Despite writing this memoir as much to unweave his own personhood as his father’s, Michael Kupperman does not reflect very much on his own experiences outside of the very beginning of the novel and towards the very end. Even the art style separates him from his surroundings, with all other people drawn in a realistic, photographic relief style, and him as a more cartoonish figure with round eyes and only minor changes in expression. However, when he and his father do communicate their regrets, how little guidance Joel had given Michael in his childhood, how little time they spent together, that the understanding the son has gained of his father becomes clear. The changing of time, technology, and culture is an ever present theme and acts as a parallel movement to Michael’s realization of his father’s life. As television took over to radio, as entertainment was consumed more through visuals than audio, the illusion of a innocence starts to fade and be left behind. Resentment turns to empathy for both the narrator and the reader as they learn how a father’ repressed trauma continued to shape him, even as he distanced himself from the show that force him into the spotlight and built a life post fame. About the reviewer: Yi Zou is a graduate student studying fiction at The New School.